The pretty little Japanese prefecture of Aomori still remains somewhat off the tourist trail, making its natural beauty and fascinating history even more captivating to those who discover it, and ultimately fall in love with it. Even for a country bestowed with as many natural assets as Japan, Aomori is a rare beauty. Set on the northernmost tip of Honshu, the prefecture is one of the country’s most bewitching. Embracing the sea like a crown, embellished with emerald forests that transform to rubies and amber come autumn, and with beautifully preserved traditions dating back to the Edo period, it’s astonishing Aomori remains relatively unknown. While tourists flock to Japan’s larger cities and flood her snow-frosted mountains, Aomori sits quietly, tending to her apple orchards, admiring her changing foliage, and enjoying the bounty of the sea at her feet. But those who know her (of which you may now consider yourself one), come year round to revel in her summer festivals, admire her soft blossoms in spring, put ski to powder in winter, and hike her autumn woodlands. 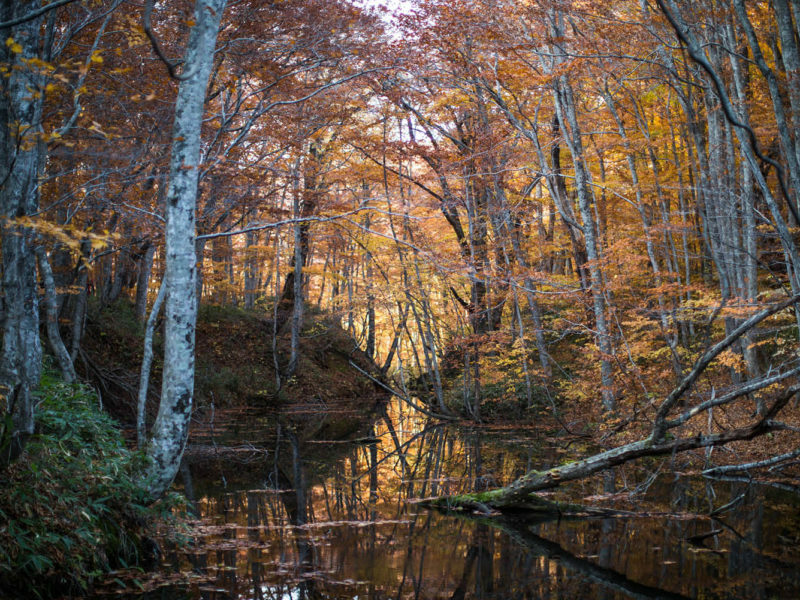 In fact, autumn in Aomori is particularly enchanting, no matter what your interests. If you’re planning a visit to Japan this season, make sure you find your way to this partially hidden gem to unearth a little more of her persuasive charms. The Japanese are known for their deep appreciation of nature. The meditative, re-energising influence of our terrestrial environment can be experienced by all of us, if we take the time to acknowledge the shudder of leaves in a breeze and the ceaseless rhythm of flowing water. This sentiment is easily understood with a visit to Towada Lake, the largest caldera lake on Honshu, and the calming Oirase Mountain Stream, both of which are part of the Towada-Hachimantai National Park. Stop by Towada Art Centre to see how the lake has shaped the community and inspired many, while the cascading stream will restore peace to anyone who hikes alongside. If Towada has ignited your enthusiasm for nature, make the Shirakami Mountains your next stop. 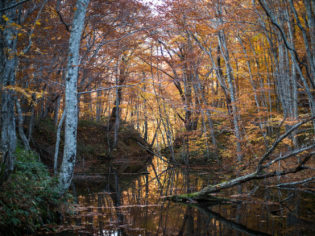 At this UNESCO World Heritage Site you’ll find the largest virgin beech forest in the world. Or take in the magnificent autumn leaves with a stroll around the Hakkoda Mountains and explore the ethereal beauty of the lake system, Lake Juniko, which is surrounded by a blaze of red and orange come autumn. Aomori prefecture is bestowed with incredible art galleries, museums, and historical sites. Not to be missed is the Aomori Museum of Art. The sleek, minimal building designed by Japanese architect Jun Aoki proudly houses collections from local Aomori artists, as well as a permanent collection that includes the works of celebrated pop artist Nara Yoshitomo. Nara’s 8.5 metre Aomori-Ken dog statue is an adorable highlight. Another must-see location for art and history lovers alike is Hirosaki Castle. Built during the Edo period in 1611 by Nobuhira, lord of the Tsugaru clan, the castle, complete with moats, yagura towers, and 2600 cherry trees, is widely touted as one of Japan’s most elegant. If you’re looking to completely disconnect from your digital life and surrender to simplicity, make your way to Aoni Onsen. As the crisp autumn air takes firm hold in Japan, there are few things more relaxing than enjoying a traditional onsen. Lit only by oil lamps, Aoni Onsen is known as the Lamp-no-yado or the ‘Lamp Inn’. This authentic and remote ryokan is the only place to stay here, so be sure to book ahead. Surrender to the art of idleness, because there’s no internet, TV, or electrical outlets, just four different baths, wholesome home-cooked food, and nature. Bliss! A must-do when in Japan! Thanks to its position curled around the sea, Aomori benefits from incredibly fresh seafood. You’ll sample the bounty of sea-dwelling delights wherever you dine, but a visit to the lively Auga Market, a fish market in the centre of town, is unmissable for food-lovers. Be sure to try the ichigo-ni, a simple but restorative dashi-broth fish soup featuring abalone and sea urchin. Aomori Prefecture also grows most of Japan’s apples. An Aomori apple is likely to be the juiciest and crunchiest you’ve ever tried with the balance of sweet and tart at near-perfection. You can try the apples in an array of treats, but don’t leave without biting straight into the whole fruit just as nature intended. Take the 80-minute flight from Tokyo Haneda Airport to Aomori or you can arrive by train from Tokyo in about 3.5 hours. For more information about Aomori and to plan your trip, visit en-aomori.com; facebook.com/hakkodajapan; facebook.com/aomori.jp.